Back in May of this year I bought a classic lorry to take to rallies and generally tinker with in my old age. The vehicle, a 1955 Albion, was once a single decker bus but had been in a rear end shunt, lost its body and had the chassis shortened. For many years I had cherished a dream of owing my own classic but circumstances had always conspired against me and so it was put off year after year until the years became decades. However I finally scraped together the funds and had a place to keep a vehicle and the Albion became mine————or so I thought! The Albion was the ideal vehicle for me and because it was a “pretty” lorry had the approval of my better half, Sue. 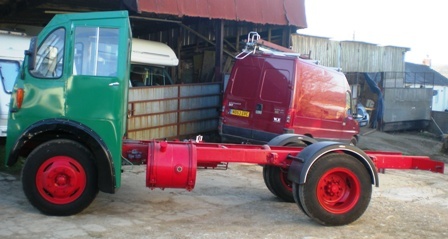 The previous owner was a motor mechanic who had spent no less than 13 years completely rebuilding it into chassis/cab form and all that was needed was a body, probably a tipper or platform, to make a very attractive vehicle. With its five speed box and high ratio back axle giving it a top speed of 45mph, a fuel consumption of 15 mpg and relatively light steering the Albion was perfect for the older enthusiast like myself. I live in Cambridge but the vehicle was in Cornwall and even though it had performed well when I had taken it on a 10 mile road test I decided that a 300+ mile trip in a vehicle of that age I was not familiar with could be asking for trouble and so I arranged via the internet for a haulier to pick it up on a low loader and transport it to my place. Because the Albion was garaged up a long, narrow farm track unsuitable for a low loader the previous owner, Derek, was to take it to a lay-by on the nearby A30 where it could be loaded. However things didn’t go smoothly because on the arranged time the low loader didn’t show up and so a second rendezvous was arranged with the owner of the haulage company for pick up the next day. Again the low loader didn’t show but the owner of the haulage company himself arrived in a taxi and after a long explanation about his driver missing the lay by and having to turn around at the next junction was given the keys. With hindsight it is easy to say that Derek should not have done this and waited for the low loader to appear but he needed to get back to work and really had no reason to think that anything was amiss. He could have taken the Albion back but had already been let down once and didn’t fancy a third trip out to the A30 and so the Albion was put into the care of the haulier. There was of course no low loader, this was a fiction made up by the haulier (I am not permitted to name him at this time but will refer to him as Pondlife) and he had intended all along to drive the Albion himself presumably all the way to Cambridge! Because Pondlife’s low loader hadn’t shown up at the first rendezvous the Albion had been parked outside overnight and unfortunately had the driver’s windscreen broken by vandals. Imagine my surprise when Pondlife rang me to say that the doors kept blowing open and that he was going into Exeter to replace the broken screen. I was mystified and told him that I knew about the screen, didn’t want it replaced and anyway I didn’t think windscreens for 1955 Albions would be readily available and that surely the best way around it was to unload and reverse the Albion onto the low loader. I was beginning to have my doubts now about having to tell a lorry driver his job but my Albion was on its way at least and was told it would be with me the next day. The next day came and went, and the next, and the next and despite repeated calls and messages Pondlife wasn’t answering his mobile or landline and so I decided that I had to report my beloved Albion as stolen but before I could do so the Law required me to write a recorded delivery letter to his business address and give him a reasonable deadline to get in touch with me. I sent off the letter and the same day Pondlife rang to tell me that his driver was in London with my Albion on board and picking up another vehicle to make up a load and that it would be with me in the morning. Needless to say the next day came and went, Pondlife had blatantly lied to me because as I learned later he had actually sold the Albion to a garage in Exeter at least a week previously on the day he picked it up! Once I could legally report it stolen the Cornwall police thanks to a newspaper article instigated by them quickly found the vehicle when the garage owner who had bought it from Pondlife came forward. However that’s not quite the end of the story, because the Law moves so slowly, not the police themselves but the Law, I still haven’t got my Albion. It is safe at the Exeter garage but Pondlife hasn’t answered his bail and until the case is tried I have to wait to claim what is legally mine. I’ve missed the rally season this year because of this silly man but am hoping to be out on the road next Spring———-I’ll keep you posted! I enjoyed a couple of years of rallying with the trusty Albion but regretfully had to sell it but it went to a good home, Tescos no less who have rebuilt it with a van body and generally cleaned it up. In fact it looks a treat and I’m hoping to take it on the 2014 London-Brigthon run. Incrsdibly I am still awaiting the outcome of the court case! Crumbs Mike I’ve just read the story of your Albion and I am gobsmacked. Copyright © 2010 Transport Artist. All rights reserved.